Spring must be coming! I'm seeing a few nice deals on Radio Flyer products. The Radio Flyer brand is so timeless (doesn't this tricycle look like it came right out a classic family TV show? ), you can't go wrong! 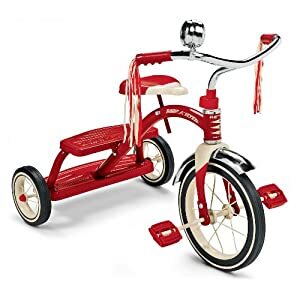 Right now you can pick up the Radio Flyer Classic Red Dual Deck Tricycle for $48.96. That's 46% off the list price of $90! Shipping is free on this item, too.